There are a lot of archaic beer laws around the United States, and most of them do nothing good for the craft beer industry. The state of Wisconsin is no exception with their controversial "Tied House" laws (other states including Illinois have similar laws), enacted shortly after Prohibition ended. Originally intended to protect small brewers being forced out of bars by the big guys, the aging law now has the exact opposite effect. Earlier this year, word spread that Like Minds Brewing, one of the state's most promising new brewers, had been forced to find new digs in Chicago. Wisconsin's loss is Chicago's gain. Setting down roots in an old Near West Side warehouse previously used by Goose Island, the brewery is now in their first full week of production. Founded by John Lavelle, a developer turned brewer, and Justin Aprahamian, a James Beard award winning chef, the brewery is set to take on the Chicago market. On the verge of releasing their first beers to market, we sat down with John and head of sales Zach Houlahan to find out what's brewing at one of the city's most exciting new breweries. Your move from Milwaukee to Chicago made big news up in Wisconsin, but for those down here who may just be hearing about Like Minds, give us the scoop on your background and the challenges you faced up there. John Lavelle: Justin and I started this project in Milwaukee and we had a friend of ours who offered to let us brew at his brewery and develop some recipes. But it was never going to be as big as it is today. When we started, the reception was really great. People really seemed to like the beer so we started thinking about doing something with it. We went far into finding a place in Milwaukee and signed a distribution agreement. At that time, they said, "Well, let's make sure you can be a brewery in Wisconsin." We go to the state and they said, "Not a chance." JL: It's because of Tied House laws in Wisconsin. Since Justin owns Sanford Restaurant and they have a liquor license, he could not be a production brewery in the state of Wisconsin. That's crazy! And totally stifling. JL: It is crazy. The idea of the law was apparently to protect consumers. But it's kind of served the purpose of limiting them. And now, you're opening a brewery in a different state instead. So shame on Wisconsin. JL: It came to a funny point with them too. We asked them, "What can we do? Is there anything we can do to make this work?" They said, "You can go to Illinois." That was the first time we thought, well... maybe we should. You kind of think about whether the project is right to have at all. 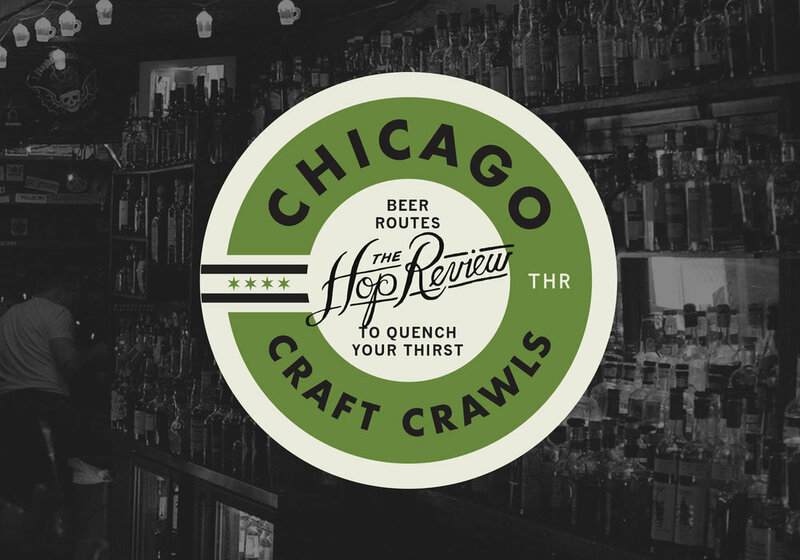 But coming down here and realizing the beer market that Chicago is, it's a no-brainer. We should have been here all along. It's such an awesome market. Honestly it's kind of a blessing in disguise. So you looked at a lot of properties there, then found out you had to move. That had to be frustrating. JL: We went through 50 plus properties in Milwaukee and found one we really liked. Actually, it's a lot like this building — a lot of brick and wood, it kind of felt right. When we figured out that wasn't happening we came down here and, as you might imagine, expense is a big part of being in Chicago. If you want to be in certain areas, you're gonna get absolutely destroyed on rent. Warehouse space isn't that easy to find and you have to find something that's zoned the right way. We probably went through at least 50 more buildings. Whether the plumbing wasn't right, it didn't have floor drains, it wasn't zoned properly, or the expense was insane to get up to code. We walked into this one and knew, this is it. The ceiling height was perfect and there was already a big goose and Bourbon County barrels on the wall! This was meant to be. So Goose Island owned this space? JL: They just leased it. The landlord must love his breweries then? JL: Yea, it was a natural fit. Goose Island had already sealed the floors and the floor drains were in place. They weren't fully functional, but they were there. Your setup is beautiful. How big is the system? JL: 30 barrel. When we were out looking for places, another brewer made a great case for starting this big. They said that you didn't want to be out shopping for another system in two years and trying to figure out what to do with this one. Do it right the first time. And you've received support from the local brewing community? Being the new guy in town can be rough. JL: That's one of the best things about this community — how people reach out. Whether it's people from the Brewer's Guild or Goose Island. Those guys came over almost right away. The Illinois Brewer's Guild is super strong. In Wisconsin, obviously Miller has been there forever and it's a Miller state. So accommodations for craft brewers aren't exactly top of mind. So were you familiar with the Chicago scene before you came here? JL: Yes, my sister lives in Chicago and I have family in Chicago. This was our vacation spot, heading south to the big city. So Zach, how did you get involved with John and Justin? Zach Houlahan: I came from Dogfish, and I was at Oskar Blues in Colorado before that. ZH: At the time I was finishing up college, Oskar Blues was looking to start their sales team and there wasn't any really great business prospects. I was just looking for a way not to have to move back to Iowa too quickly. How long have you had beer you can take out with you? It can't be easy to sell a product that's still in the works. ZH: They had some Imperial Stouts that they had bottled from our previous contract arrangement. Maybe about 12 bottles... so we've been using them sparingly as what will be representative of our beer. JL: We've been able to do some experimenting to figure out some things we didn't want to do. We actually dumped a few batches down the drain. I think technically this is brewday 12... and six of them we felt were good enough to get out the door. You can't go into this market without exactly what you're trying to do. You try to bring to the consumer nothing less than the best beer you can possibly make. There's no leeway here. So the pressure to step your game up is extremely intense. I kind of enjoy it. We recently spoke to Band of Bohemia and Jared Rouben at Moody Tongue about how they incorporate food into the brewing process. From what we've heard, it sounds like you're thinking along similar lines. Can you speak a little about the beer? JL: With Justin being the caliber of chef he is, what we do is try to make the best platform for something he can adjust or add to. For example, today we're brewing the Nutella Coffee Stout. We do hazelnut and chocolate, and try to blend those things in to make the absolute best platform. We make a beer that gets out of the way of the ingredients but continues to be an awesome beer. Where do the recipes themselves come from? JL: The beer recipes are generally collaborations between Justin and I, especially the culinary driven stuff. He'll tell me where the beer needs to be for him to carry it on. I'm generally responsible for the straight brewing, the IPAs, the Stouts. So if you're brewing something like a coffee beer, are you starting out with the base then adding to it? Or do you go all-in with set ingredients? ZH: I think you want to get the beer to a point that it's receptive and meshes really well with the coffee. JL: Yea, we wouldn't sell the beer by itself. It's built for the coffee and the recipe is designed around that. One of the strangest things I've found working with Intelligentsia is that coffees change beers in really strange ways. The end product tastes nothing like the original coffee or the original beer. What's your early beer lineup look like? JL: We've got the Horehound, the IPA, which is German for mountain hops... nothing disparaging or anything like that! It's pretty close to an 8% IPA, 75 IBU's. I think technically people would consider it a double. We'll have a Pale Ale, around 6%, that's almost entirely Equinox hopped, with some Cascade to balance it out. ZH: We'll have a Saison as well. We've really identified the chef driven accounts — places like Fountainhead for example, where Cleetus is very active in the beers they're bringing in to complement the foods and different projects they have going there. Then you have accounts that gravitate toward a lighter beer that appeals to a broader consumer base. We really feel that we have a beer for any account. So we've gotta ask... what's up with the giant storage container and mural? JL: It's an old shipping container. It's six inches of polystyrene on all sides and it's all stainless steel. It's a perfect cooler. It's good reuse too, otherwise these things just sit in yards. It's being painted now and we just told the artist to do his thing. Speaking of artists, the label designs we've seen from you have been pretty diverse. What's the thought there? JL: When Justin and I first started thinking of doing stuff like bottle artwork, we didn't consider a cohesive brand. We just thought we'd reach out to some artists that we really like and see what they think. So we reached out to Rob Jones who does all the White Stripes posters. We hit him up on Twitter and said, "Hey, would you ever be interested in doing a beer label?" He tweeted back, "I like beer, send me an email." We did that and he started curating a lot of the artists. He did one for us as well but that one is yet to be released. That container is huge but you've still got a ton of space here. What are your plans for the rest of it? JL: The other interesting part about the zoning here is that you're allowed to have a space up to 20% be your tasting room or any retail space. That side is 8,000 sq ft and this side is 2,000 sq ft. So it's exactly perfectly split without any work. Hmm, a tasting room you say? What's the plan there? ZH: With our proximity to the United Center, we would like to get it up as quickly as possible. So as soon as they clear everything out from the installation, we'll start working on what happens over there. The city of Chicago will probably take their time. Starting a taproom seems like it could be an intimidating prospect for a young brewery? JL: Yea, I mean I don't know how to run a restaurant or bar, that's never been my background. So having Justin on board and his experience with his restaurant really gives me a lot more confidence in our success. So what's the timing on the taproom? The more taprooms the better in our opinion. ZH: We're aiming for the beginning of next year. My personal goal is to have it up and running by the Big Ten Tournament. It's kind of arbitrary but it's what I'm aiming for. We almost forgot to ask... where does the name Like Minds come from? JL: Well Justin, myself, and another guy were all sitting around having beers and discussing music. This other guy said, "We're all of like minds, let's go keep drinking!" Three days later, we're sitting around thinking that we just have to name this thing. All of a sudden, it just clicked in my mind, "We should call it Like Minds!" The concept was, and still really is, collaboration — collaboration between the kitchen and the beer. It really felt like a great fit with everything we were trying to do. It was the first thing we tried and it just stuck. You're in early days here, but where do you see Like Minds in six months? JL: Honestly, the biggest goals for the next six months are to get these tanks full and get the taproom built out. If we have that going on in six months, I'll be a very happy guy. ZH: We just want to make the best beer we can possibly make and have all the confidence in the world that the rest will fall in line. JL: We want to earn the reputation that people can enjoy the beers we're putting out there. In six months I hope people can have the confidence in us that we're not going to put our a stinker. ZH: We're just humbled to a part of one of the best emerging craft beer markets in the country. There are some of the established staples, but the reception from both consumer and retailers about having something new out there is great. The excitement is still out there and there are a lot of markets in the country where you don't have that anymore. There's reluctance with the over proliferation of craft brewing. But I think there's still a lot of absorption of craft brewery available in Chicago. Last question — what are you drinking at home? JL: Oh, a tremendous amount of beer. I've been a beer nerd for a lot longer than I've been a brewer. For me, it's been 3 Floyds, New Glarus, Goose Island, Revolution, Half Acre. ZH: The last thing I had that I've really been digging is Destihl's raspberry sour, the Lynbrook. All solid options! Thanks for having us in guys, we'll be on the lookout for Like Minds around town any day now. A huge thank you to John and Zach for taking time to chat with us just days before their beer hit the market. Look for Like Minds beer on draft around town today and packaged at your go-to bottle shop in the coming weeks.